The solution for your sensitive components packaging program, the AVC is hand assembled using top grade materials and components. The AVC is compressed air driven, eliminating any concern regarding noise, vibration or heat generation. 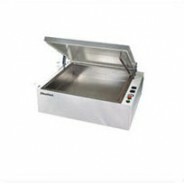 Unlike electromechanically driven vacuum sealers, our characteristic AmeriVacS design prevents particle generation and oil contamination that often lead to costly maintenance and downtime. Clean Room compatible, the AVC is the ideal choice for tray, tape and reeled products, as well as popular shipping tubes. Precision components guide the AVC's industry setting seal speed and ensure clean, wrinkle-free seals without any bag distortion. Order an optional second seal bar, and the AVC instantly doubles smaller package volume. One button touch sealing, preset vacuum controls and a large 22"x22"x4" stainless steel vacuum chamber best define this no nonsense workhorse.